Banking is something all of us rely to save the surplus money we have. In India, banking sector has been touching high peaks of glory with every passing day for quite some time now. Since the competition between banks is at high peak nowadays, so, as to cover the heat, every bank tries to new lucrative services in long list of all services they offer. Private sector banks in India have been getting handsome increment in customers count for quite some time now. Talking about fastest growing private sector banks, Karur Vysya Bank shines at respectful position. It's a private-sector bank with its headquarter in Karur in Tamil Nadu. Just like any other bank, this one has got a big list of services to offer. Of course, it lets you enjoy banking at home via the internet banking facility. Those who don't know, with internet banking, you can perform a no. of banking things at home. You can check your account balance, summary, history etc anytime you want to. You can send funds to same bank or other banks via net banking. The just said service is the biggest boon of internet banking. If you have been using internet banking for quite some time now, you know it very well how to transfer funds to other banks. Those who are looking to know how to transfer fund from Karur Vysya Bank to any other banks in India through net banking, just keep reading this post ahead, as it covers detailed guide to do the same. Of course, the very first step you need to do is to head over to the official website of Karur Vysya Bank. Just Google to know it. Or, to move with ease, just click on this link http://www.kvb.co.in. There lies Internet Banking section on right side with option to go to Login page. Click on this option. A new tab will open that requires you to enter your internet banking id and password. So, just provide it so that you can login. You will be taken to 'Accounts' page that contains all info related to your account, like balance, summary etc. In the tabs lies 'Payments' tab which you need to click to get the internet fund transfer option. So, just click on the said tab. Since you are sending money to other bank account for the very first time, so, before you can do so, you need to add beneficiary. For this, you need to head over to 'Beneficiary Maintenance' section, link for which lies on the left hand side. So, locate the link and click on it. Clicking on the said link will bring a new page. In this page, look for option that reads 'Create Beneficiary'. It lies on top right side. So, it should not be any problem for you to get it. Before you click on 'Create Beneficiary' option, you need to select the type of transaction you intend to perform. It contains a drop-down list in which you need to find and select 'NEFT Funds Transfer' option. You will now be on Beneficiary creation page. It requires you to provide few details about the new intended beneficiary. The first info you need to provide is beneficiary id. It can be anything you like to. For instance, set it as 'TestID". Now you need to enter Beneficiary name, beneficiary address, city, country, zip/postal code. After providing all details that this page asks you, you can proceed ahead. The next page is meant to fetch details from you about beneficiary bank account. You need to enter account number of beneficiary, his/her bank name, IFSC Code. If you don't know IFSC code of intended beneficiary's bank, then you can look up for it by clicking on 'glass lens' icon that lies next to field meant to enter beneficiary IFSC code. Clicked on the glass lens icon that I just asked you to click on? You will see a new window opening. In the new window, provide any combination of detail regarding intended beneficiary's bank account. You need to provide minimal details so that you can use the search feature. After providing details, click on 'Search' option. You will be presented a number of search results. Look for the bank name and the particular branch of that bank in which beneficiary has got his/her bank account. Once you get the right bank account and branch, just highlight it and click on 'Select Bank'. Once you are done finding IFSC code of beneficiary's account, you will be taken back to the page where you clicked the glass lens icon. Update is that the IFSC Code will have required code entered in it. You now just need to click on 'Add'. The new page will show you your entered details. Just review them and make sure they are correct. Click on 'Confirm'. That's it. You have successfully added the beneficiary to send him/her money via net banking anytime you wish to. In the 'Payments' tab, just click on 'NEFT Funds Transfer' option that lies on the left hand side. You will be taken to page that asks you a few details so as to proceed the online transfer. The fields with asterisks are necessary to fill. Firstly, you need to select the source account from which you want to send money to intended beneficiary. Now, provide the beneficiary name detail. For this, just click on 'Lens Search' icon. It will open a new window that contains names of all beneficiaries added in your account. Of course, the list contains the name of beneficiary you just added. Select the intended beneficiary from the list of all added beneficiaries. The system will fetch bank account details of selected beneficiary itself. Now, enter the amount you wish to transfer. Enter the narrative if any. Finally, click on 'Initiate' option. A new page showing you all details related to transfer that you want to initiate will come up. Just review the details and then click on 'Change' if you wish to edit it. If not, click on 'Confirm'. Now, a new page will come up that contains transaction reference number. You need to enter your transaction pin and OTP (One Time Password). That's it. You have successfully initiated the process to transfer fund from your Karur Vysya Bank to any other bank via net banking. The amount will get credited to selected beneficiary's account within just a matter of few working hours. So, congratulations! You have successfully learnt the process to transfer fund from your Karur Vysya Bank to any other bank via net banking. You are now all set to send money to any account, anytime you wish to, while sitting at home. The process is very simple and I hope you have learnt it successfully. So, just implement it. In case you need any help from our side, use the below comment section to communicate with us regarding your queries. I want to transfer money 24000 to sbi account please tell me the procedure? I am not able to get High security password to transfer money from KVB to sbi bank account. I can't able to log in my id.. And to get otp through email what's the procedure I have to do. 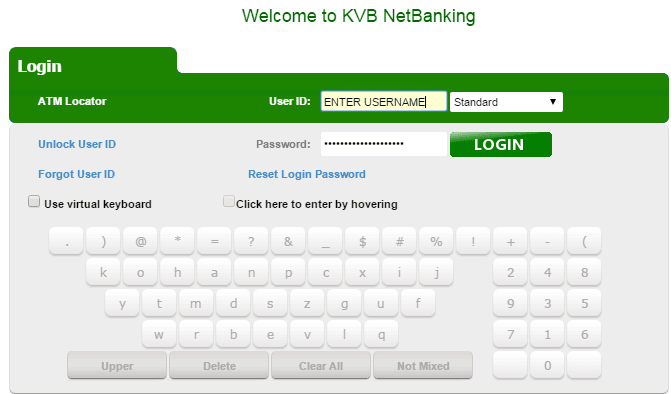 in my kvb netbanking i couldn't find the internet funds transfer option.Only own account transfer is available. what to do? how to use kvb imps fund transfer option. I have an account in KVB Hanamkonda. I want to transfer funds to my son's account at ICICI Bank. If you have net banking, Just add beneficiary and transfer money via NEFT. If you don't have net banking, visit any nearest branch and deposit amount to your son's account. I need this service urgently.